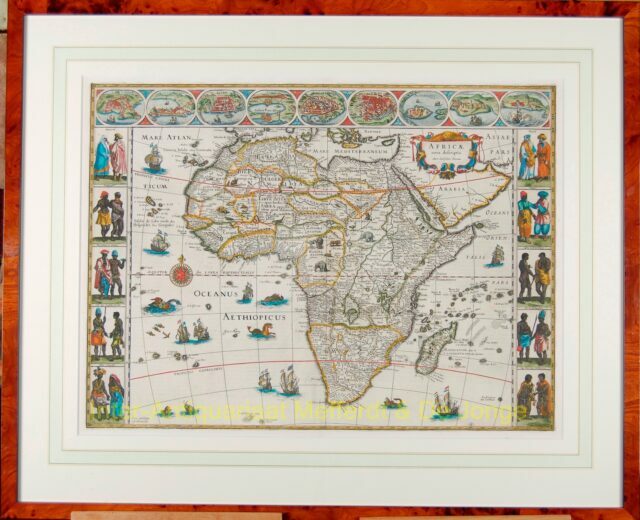 “Africae nova descriptio” Copper engraving with outline colour to cartographical image and full colour to pictorial borders. Published in Amsterdam by Willem Jansz. and Joan Blaeu c. 1640. Size: 41 x 55,5 cm. In handsome walnut frame. This is a cornerstone map of Africa and is one of the better known, more decorative maps of Africa of the seventeenth century. The map shows major African towns across the top: Tangiers, Ceuta, Algiers, Tunis, Alexandria, Cairo, the island of Mozambique, The Mine at St. George in Guinea and Canaria in the Canary Islands. The left and right borders show various indigenous costumes: Moroccans, Senegalese, traders in Guinea, Congolese, Egyptians, Abyssinians, Mozambicans, the king of Madagascar and inhabitants of Cape of Good Hope. The body of the map is richly embellished with animals, including elephants, monkeys, ostriches, gazelles, lions, cheetahs and camels. In the oceans are numerous sailing ships, sea monsters, flying fish, and a gorgeous compass rose. Much of the geographical information is still based on the Ptolemaic maps, with the Nile shown with its source in the Lakes Zaire and Zaflan. Also included are various other mythical lakes and rivers including the famous Lake Sachaf. Only coastal towns are named on the Cape, with the printing covering much of the unknown territory. Willem Janszoon, or Willem Jansz. Bleau (1571-1638) as he was to be later more commonly known, was one of the noted Dutch cartographers and map publishers of the seventeenth century. After preparation as a pupil of the great Danish astronomer Tycho Brahe, Bleau initially concentrated on globemaking and separately published maps, including wall maps of the continents. From 1608, he dominated the market for wall maps and sea atlases, and in 1630 produced his terrestrial atlas. These atlases were continued by his sons Joan (c. 1599-1673) and Cornelis (1610-1644), culminating in the great Atlas Maior of 1662 in 11 volumes by Joan Bleau with subsequent editions. On February 23, 1672 a fire at the offices of the Bleau publishing effectively ended the successful Bleau business. Joan died after the fire in 1673, and, though Joan II continued the business for some time, many of the plates were auctioned shortly thereafter. This map was not reprinted after 1672 as the Africa copperplate is not known to have survived the fire. 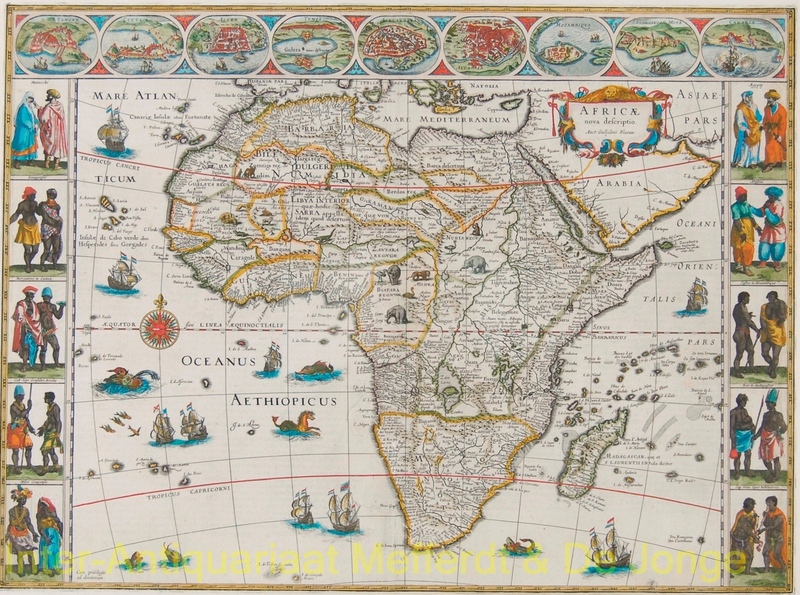 The Spanish edition of the Atlas Maior was in the process of being printed, including the section on Africa with this map of Africa, when the fire occurred. Blaeu’s maps set the standard for the quality of the engraving, paper and colour, as well as a fine depiction of contemporary geographical knowledge.